The Hotel Lidia in Gabicce Mare, a few steps from the beach, is a 3-star hotel especially indicated for families, with services dedicated to children, such as the playground area and the kitchen for preparing baby food. It welcomes pets of all sizes. 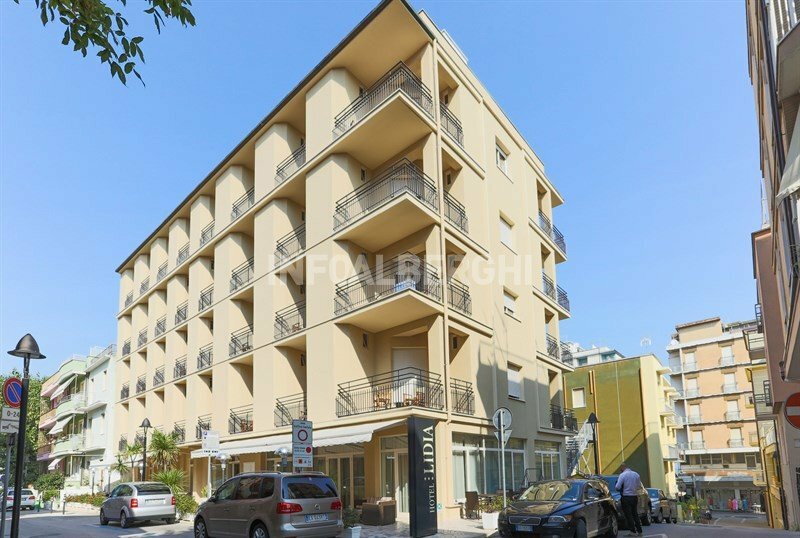 The hotel is located near the beach and a few steps from the Gabicce Mare canal. Likewise, the center of Gabicce is a short walk through the town's pedestrian boulevards. Each room has a furnished balcony, 20 "LCD TV, WI-FI, fan and air conditioning, safe, minibar, telephone and private bathroom with hairdryer, shower or curtain (in bathrooms equipped for disabled people). FAMILIES: also available family and connecting rooms, for groups and families, and solutions with two bathrooms. Sun terrace with beach umbrella and sunbeds, free use of bicycles, lift, equipped fitness area, rumpus room with TV, 24 hour reception, luggage storage, late check out service upon availability and shuttle service. The hotel organizes theme nights. PARKING: free outdoor places in the all-inclusive formula. Garage available on request. AIR CONDITIONING: available for free in all environments. SERVICES FOR DISABLED: entrance on the ground floor, lift for disabled people, rooms with room for wheelchair access, bathroom with shower accessible. PETS: admits pets of all sizes, for them there is a welcome kit with bowls and croquettes. BREAKFAST: continental type with sweet and savory variety. LUNCH AND DINNER: the kitchen offers typical dishes of Romagna and Marche with 3 menus to choose between meat and fish, accompanied by buffet of appetizers and side dishes. At the end of the meal, desserts and fruit are served. Water and wine are included in every accommodation package. VARIATIONS: gluten-free dishes and vegetarian menus are available on request. OTHER: every week Romagna nights are held and marinate with typical dishes, wine and music. In hotel: indoor and outdoor playground area. Pediatric consultation on request. In the room: crib and tub for the bathroom. At meals: bottle warmers, baby menus, high chairs at the table, games and coloring books at meals, kitchenette available to parents with fresh broths for preparing baby food. On the beach: playground area, entertainment, nursery, baby and mini club. The hotel has an agreement with the Bagni n. 5-7-8. Prices are per person per day for minimum stays of 3 days. - In case of early departure than the reservation we will be charged for missing overnight stays up to a maximum of 3, according to hotel regulations. from May 23rd to September 20th the children from 0 to 3 years (in room with 2 adults) will be our guests and will stay for free (1 free per room). and then ... our staff will be available to customers to agree on the children's menu!